A little bit of fun stuff today. I'm playing a little catch up for the last month - can you believe it's the end of March already?! Seriously, where did this month go?? First of all, I want to send out a big thank you to Amanda from School House Scraps for giving me the Liebster award. Now, what is the Liebster Blog Award? but it can also mean 'favorite'. I also want to thank Cameron from Homemade for giving me The Versatile Blogger award. It's always nice to be noticed and appreciated. The Versatile Blogger Award is a great way to introduce different bloggers to each other and to promote quality blogs that awardees and their readers may not have discovered otherwise. So thank you so much, both of you, I'm honored, really. 1. If you could have coffee with any one person, living or not, who would it be? Well, I don't drink coffee, but I'd love to have a Coke with either of my grandpa's. They both died just before I was born and I'd love to be able to sit and chat with them. My Grandpa C. worked for the Coke company for years, so it'd have to be a Coke. This is my Grandpa and Grandma C. Aren't they just so cute! 2. What is one quality you'd like to develop in yourself? It would have to be patience. I think that's why I was blessed with triplets, on top of the 3 kids we already had, because I really need to learn patience. I'm working on it daily - some days they test it more than others. :) Also the ability to NOT procrastinate, again a daily struggle. My 6 plus my niece, Ashtyn. 3.What is the last book you read, or are currently reading? I'm reading a diet book (Perfect 10 - very interesting, but I don't like these kind of books very much so it's slow going), an organizing your kids book - can't even remember what it's called right now, read Hunger Games last week for the second time before we went to the movie, reading the next two books this week because I forgot how good they were, and then reading Divergent by Veronica Roth (so good!) again before the next one in the series comes out in May. That's why I added it to my "recommend" list on the right side of the page. I love to read, so I had to answer both these questions. My favorite book would have to be These is My Words by Nancy Turner. I really like historical fiction (as well as YA fiction), and I have a thing for pioneers, Little House on the Prairie, that time period. 4. If time, money, and kids were not a factor and you could go anywhere in the world, where would it be? Anywhere - traveling would be nice. lol Bill is not much of a traveler. I'm really kicking myself that I didn't visit my parents while they were in St. Petersburg, Russia. 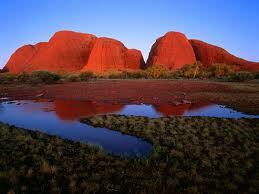 So I'd like to go there, but I'd also really like to go to Australia someday. 5. If you could only eat one dessert for the rest of your life, what would it be? Brownies! Love 'em! 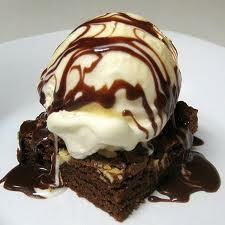 For a little variety, I'd add a scoop of vanilla ice cream and some carmel drizzled on top. 6. You are on a beautiful beach, warm sun and sand. Are you most likely to build a sand castle, or swim in the ocean? I'm building sandcastles, the ocean scares me. lol Okay, I've only been to the ocean twice, and I can't even remember the first time, but the pull of the tide was scary. I'm not a good swimmer at all. However, back in the day, I could build an awesome town of rivers and lakes in the sandbox. 7. How much time do you spend on the computer a day? Umm, too much, don't tell Bill! Some days are better than others, though, and I am doing a lot better at prioritizing and getting my things done and getting off the computer. 8. If you could relive one moment or day in your life, what would it be and why? My wedding day, there are so many things I'd do different and would enjoy more and the day went WAY, too fast. 9. What is your favorite season and why? I love Fall, when we have a good fall, the colors are fabulous, the temperatures are cooling off, gardening is done, the excitement of a new year of school is there, fun things to do, and I can start making my favorite comfort foods again, things like meatloaf and baked potatoes, and chili. However, I love Winter, too. I love the landscape covered in a blanket of white. Love a good blizzard (not if I'm out in it though), the possibility and crossing fingers hoping for a snow day, the dread of hearing the snowplow go by at 6 a.m. knowing we aren't getting out of school. The hush that a new snow leaves over everything, it really is quieter. Playing in the snow, sledding behind my dad's pickup - when I was little and now, showing my kids how to do it and watching my kids have a blast! The view out my back door. 10. Which sense would be the hardest for you to lose: sight, hearing, taste, or smell? Why? Sight - I would miss seeing my children grow up, the joy on their faces at new things, the excitement on their faces, seeing the looks that only I know what they mean, just seeing how much they will grow and change in the coming years. They've already grown so fast in these past 7 years, I can't imagine the next 7. 11. Which superpower would you choose: the ability to fly, the ability to read minds, or x-ray vision, and why? This would be a double-edged sword, but I would choose the ability to read minds. I would FINALLY be able to figure Bill out. :) I'd also love to know what people are really thinking about me or the situation, but there in lies the bad part, too. And now I'm tagging (and I call no tag-backs!) . . .
1. If you could go back in time, when would you go back to, or what time period would you visit? 2. What position are you in your family growing up and do feel you have the characteristics of that position (oldest, youngest, middle child, only child, etc.)? 3. What is your best feature and why do you like it? 5. What's your favorite thing to do on a rainy day? 6. What music are you listening to right now on your computer, ipod, in the car, where ever? 7. What talent do you wish you had? 8. Share a nickname you had/have and how you got it. 10. What's your idea of a perfect vacation - money's no object. 11. Name one thing you'd do or have in your dream home. To those I've tagged, if you don't feel like participating, no big deal. It's all fun! If anyone reading wants to play along, you can leave the answers in the comments or if you blog, answer these questions on your blog and leave a link in the comments. Thanks Amy and Kadie, this was fun! Well, Spring has officially sprung! The weather has been beautiful here this week, my kids were even begging to turn on the sprinklers yesterday (okay, it wasn't really THAT warm.) 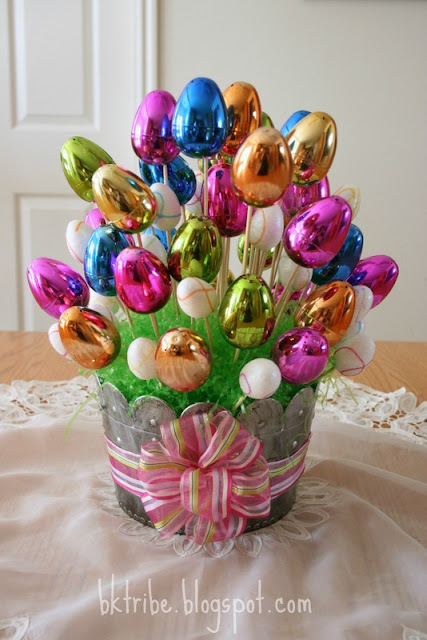 Easter is only a couple weeks away now and I thought I'd share with you this really cute idea for an Easter bouquet. My friend, Mary Jo, found this fun idea on Pinterest (I'm sorry, I don't know who to give original credit to), and we made them along with another friend, a couple weeks ago. 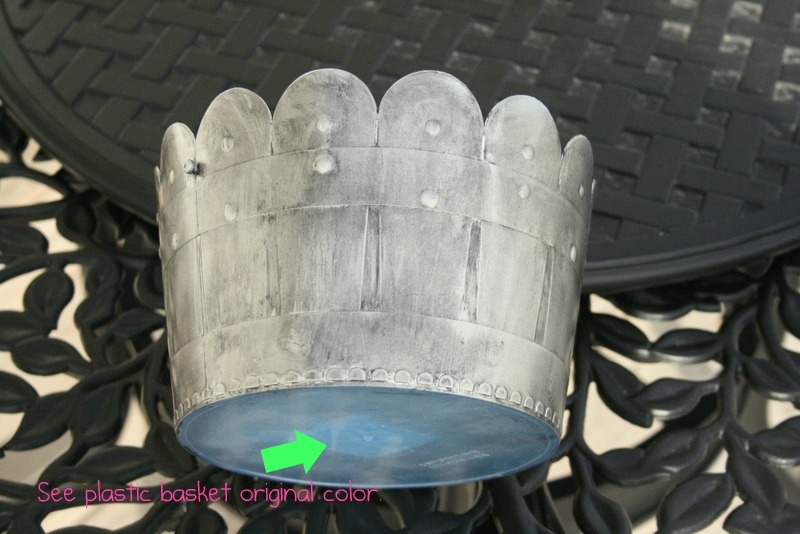 This is a very easy project and very inexpensive, too. I'm pretty sure you could find everything at the Dollar Store. If I would have thought about it, I would have cut off the little knob that held the handle on, but oh well, it's not that noticeable now. Next, start sticking the skewers into the eggs. All my big eggs already had holes in them, and the little ones were styrofoam. Put the foam into your container and start sticking in the eggs. I'm no flower arranger, so this was a little stressful for me. My basic idea was taller in the middle, then get smaller toward the edge, also watching not to put the same colors next to each other. When I was done, I filled in holes with the little eggs. I did break some of the skewers to vary the height also. Finally, tie a cute bow - I'm also terrible at bow tying, so Mary Jo tied mine and glue it onto the container. I also wrapped the ribbon around the whole bucket. Then fill with grass. It was a fun, pretty quick little project. It's really so much more fun to craft with friends. Thanks Mary Jo and Karie! Hello! I'm Jessica, a writer for Arcadian Lighting, a wonderful online resource for affordable light fixtures. Every day I get to search for beautiful interior design inspirations and then share them on lovely blogs, like BK Tribe. Thank you for letting me stop by, Kimberly! Today I'm going to share some ideas for choosing the perfect lighting for every room in your home. I hope you enjoy! If you happen to work from home or enjoy making crafts, it's important to have great task lighting. A few pendant lights hung just over your work table will make it even easier. This casual living room illustrates a variety of wonderful lighting options. Recessed lights, wall sconces and table lamps are sure to fill the room with perfect light, no matter what the occasion. Not only does this bathroom have a beautiful quality of natural light, but elegant modern wall sconces on either side of the mirrors give off a lovely, warm light just right for brushing teeth or applying make up. Faux candle chandeliers and wall sconces always add an air of glamor and sophistication to a room. Glittering silver and crystal accents throughout the room help reflect the light beautifully. Recessed lights and a pair of petite wall sconces illuminate this reading nook. Silver wallpaper with a honeycomb pattern adds a cool, modern dimension to the space. For a more magical effect, a Moravian star pendant light provides a lovely ambient lighting. 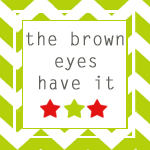 The charming design and choice of colors make this star pendant a brilliant eye-catcher. These chic industrial pendants give off a welcoming quality of light that's perfect for the dinner table. The golden brass shades provide a warm, inviting glow. These bulbous clear pendant lights are a great choice for lighting any living spaces. The clear glass shade ensures a brilliant quality of light, and the design is sure to add a modern touch to any room. Images 1 | 2 | 3 | 4 | 5 | 6 | 7 | 8 Which of these lights is your favorite? Let us know in the comments! And be sure to stop by Arcadian Lighting to find the perfect light fixture for any room in your home! In early February, I signed up for a fun fabric swap that Amanda at Ninth Street Notions put together. We were instructed to pick out 5 fat-quarters of material and send them to our partner. Then make something out of the fabric you were sent. Sounds fun, huh! The funny thing is, I have a table runner half finished with very similar material/colors. So then I had to narrow down my project list. A table runner was out, like I said, I have a similar one. I didn't really need another bag, my sister has made me a bunch of them. Oh, and I'm not a really great seamstress - wait, I'm not even good enough to be called a seamstress, let's just go with sewer - so I didn't want to tackle anything too tricky yet. Finally my inspiration came as my husband burned his hand, again, while taking something out of the oven and started cussing and grumbling about how we need some good hotpads. That's it! Then I found this super easy tutorial here. This was so simple, and she did such a good job of it, I didn't redo the tutorial. I'll just share what I learned. I tore the strips the length of the fat-quarter, giving me enough length for two strips. Same with the backing piece, so after I finished the first one I had another one all ready to go - matching set. :) Also, after looking a little closer at the hot pad Bill burned his hand on and seeing it did use the Insul-Bright, too, I used two layers of the batting, making sure that the metallic side (which reflects the heat) was facing out. It was really quite fun and rewarding to have something I made myself to be so useful. lol I gave them a good test and am happy to report no burnt hands. Sprocket Pillows - this is really cute! Ipod/Camera Case - if you noticed, I didn't use the gray/orange print from up above. This is what I'll be making with that material, a case for my new video camera I got for my birthday. Poochie Bags - the name makes me laugh, but they're cute. That's just a few that I pinned, there are TONS of ideas/tutorials out there for fat-quarters. So grab a few quarters and have some fun sewing! Anyway, I just wanted to let you in on some fun going on at One Artsy Mama this week. Amy has been celebrating her 1 yr. blogiversary with a ton (seriously 21 different items!) of giveaways this past week. I joined in too, and I'm giving away this beaded watch. If you want it, go here to enter. Last week we were in charge of bringing treats to Billy's basketball game. I also needed a treat for the kids after dinner on Sunday, because there wouldn't be enough of the Rainbow Spring Dessert and most of them wouldn't appreciate the goodness of it. So I made two batches of cupcakes, perfect solution for the game and dessert on Sunday. Since I've pinned many a great tip and tricks for cupcake making, I decided to test a few of them out. Some were great, others not so much, so here's my thumb up or thumb down rating for some of the best cupcake tips on Pinterest. First up - This tip for making bigger higher cupcakes by filling the cups a little fuller and cooking at a lower temperature. Sadly, it didn't make any difference for me. I filled the cups 3/4 of the way full, preheated the oven to 350 and then I turned on the convection which lowers the heat to 325. Still the same flatter cupcakes. I don't know if the convection made any difference, I wouldn't think so, so maybe it was just the recipe she used that made them dome up like that. Next - This tip (or several others) for using canning rings to hold your cupcake liners so you can bake more at a time. I was really excited for this one since I was making two batches and didn't want to be in the kitchen all afternoon. I lined my rings out on my pan, set the liners in, and when I started filling, the liners all sank down into the ring. I don't know if I did this wrong, I don't know how I could do it any different, but I had a big mess as most of the cupcakes overflowed the liners and cooked onto the pan. I should have taken a picture. I measured (eyeballed) and the rings are a little bit smaller than a muffin tin cup, so it made the liners sit up straighter, thus giving a little less room for batter. They were a little skiwampus where the overflowed, or small little things, all edible still, but not very pretty. 3rd Tip - Back to the same site as the first tip, I decided to try this, her recipe for Nanny Burke's Buttercream Frosting. Winner, winner, chicken dinner! I'm not usually a fan of buttercream because it's just too sugary tasting, but this wasn't, it was buttery flavored and pretty good. I did add the shortening with it for firmness like she mentions. Now I wasn't piping it on to my finger to eat it liked she did, but it was good. 4th Tip - This genius little video for mess free filling/using your pastry bags. It's so simple and worked really well. However, it didn't work very well for using two different colors at the same time, but I think I might have filled the one too full. Finally the last tip - This trick from Our Best Bites (those girls are amazing!) for making multiple color swirled frosting. I didn't have any disposable decorating bags, so I just used ziploc sandwich bags and cut the corners off. I filled them like they said, not too full, flattened them down a little, stacked them together and slid them in my decorating bag. It worked perfectly! This was fun, I've got to try it again.